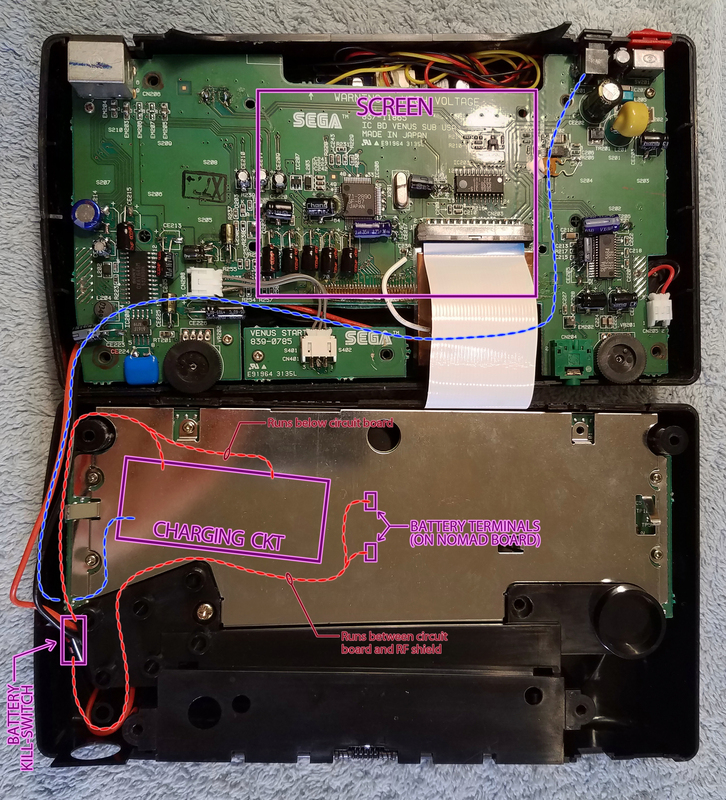 In this post, I’ve documented my design, decisions, and the results of my attempt to retrofit an internal battery into my Sega Nomad. This is not meant to be a be-all end-all guide on the best way to install a battery, this is just an experiment to see if I personally could do it, and how feasible it might be for long-term use. To that end, I have included as much detail as I could so others can build off it and try their own ideas. This work is licensed under a Creative Commons Attribution-NonCommercial-ShareAlike 4.0 International License. If you paid for any part of it, you were cheated. This post is written for informational purposes only. I assume no liability for damage done to your equipment or for any injuries you may incur attempting to emulate this project. Please be careful when working with electricity. NOTE: I’ve updated this design with a larger battery! See my new post here: link. Using two 3000mAh cells, it now clocks in at 5+ hours of playtime! This project was inspired by a resurgence in use of my freshly repaired childhood Nomad. After a few nostalgic months of gaming on-the-go using a refurbished rechargeable pack, the novelty of having an “authentic” setup was starting to fade, mostly due to the impracticality of having to carry and attach the tumor of a battery pack it uses (I guess 10-year-old Michael was less fazed by it). So I thought to myself, I wonder if anyone has ever retrofitted an internal battery into the system? But after a little research, I was only able to find a few instances of attempts, and only one was an actual DIY guide. The first attempt I found was the “Nomad X”, by Wiggy of the website RoseColoredGaming. It was apparently a purchasable, fully refurbished system with an internal battery, modern LCD, upgraded speaker, and a paint job to top it all off, but detailed information is scarce. The product page is now defunct (and WayBackMachine doesn’t have it archived), but there are scattered videos and articles to at least prove it probably existed. The latest mention of it I could find was from comments in 2014 on the above-linked video review, where they apparently had a very limited stock that sold out immediately. The second instance was a video demonstrating a one-off build by superkon316, but it wasn’t detailed enough to use for much more than a design reference. Though his build apparently worked (at least as far as his short video shows), I disagreed with his stated method of bypassing the voltage regulator to connect the batteries (which is dangerous to all components downstream of the regulator), and the cells’ selection and placement, which has them pressing hard enough against other components to cause deep indents in the cells (physical damage can potentially be a fire hazard). His design also disabled the “low battery” light, instead regulating it to an on/off power indicator. Finally, the only actual guide I could find was by the website PortablesOfDoom, though its been “under construction” since April 2014. This guide shows more information than any other so far, but still falls short on clear details. Their instructions are unclear, the pictures are blurry and poorly lit, and there’s no wiring diagram. Their guide also claims the design disables the low battery indicator, but I can’t verify this claim with the information provided. I also disagree with their estimation of 3-4 hours playtime from a 1500mAh battery. 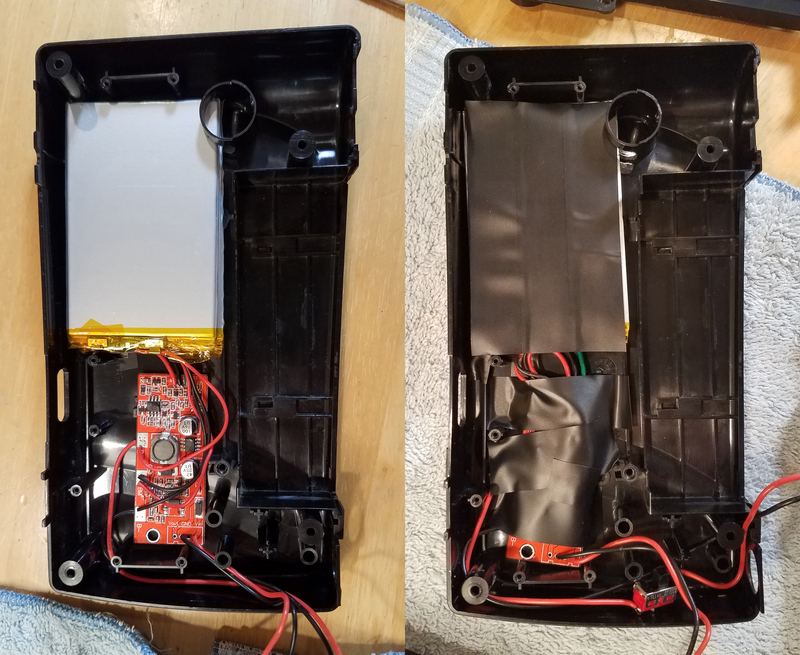 I’ve seen similar claims on other battery pack guides and sites, but never any actual proof to back it up, nor have I been able to reproduce these results having previously refurbished my own rechargeable battery pack (a 2900mAh pack totaled 4hrs,15min by my testing). My primary concern for this mod was heat buildup. I wasn’t expecting the batteries to generate much heat on their own, but their presence would have two effects. One, they would be taking up space that nearby components would normally be dissipating heat into, and two, they’d likely be pressed up against said components, absorbing heat from them. So the viability of this project came down to how hot the batteries and components would get, and if it would be hot enough to be a problem. The first step was to get a baseline temperature of the CPU the batteries would sit next to. I found a digital PC thermometer and attached it with a small piece of tape, and ran the probe’s wire out of the contrast dial’s slot. The datasheet I found for this chip, and the sheets for a few nearby components, all placed their maximum operating temperatures at 158°F (70.0°C). Starting the test cold at 71°F (21.6°C), it rose over the course of a little over an hour to peak at 100°F (37.8°C) – warm, but well within its operating range. This thermometer was meant for use in measuring the temperature of a PC’s harddrive, processor, or what have you, so it’s perfectly suited for this. After a little research, several sources claimed that LiPo cells operate best around 70°F (21.1°C) (though manufacturers will usually specify the cell’s capacity/life expectancy for an operating temperature of 80°F (26.6°C)). I also found that the maximum discharge temperature for the typical cell is 140°F (60.0°C), so even though we’re starting at a disadvantage (knowing the cells will be heated by the adjacent CPU), we have a little leeway. The takeaway from all this is, I would move forward with the project, but I’d do another temperature test once it was done, and if the batteries got too hot I’d pull the plug (metaphorically and literally). I personally wouldn’t be comfortable operating a handheld game that heated to 140°F, and this says nothing of the stress the extra heat would put on the Nomad’s 20+ year old components. My initial design was simple; hardwire the new internal cells to the Nomad’s original battery terminals (which would keep the “low batt” light functionality), then run wires from the Nomad’s DC jack to recharge the cells via a voltage step down “buck” circuit and LiPo charging circuit. 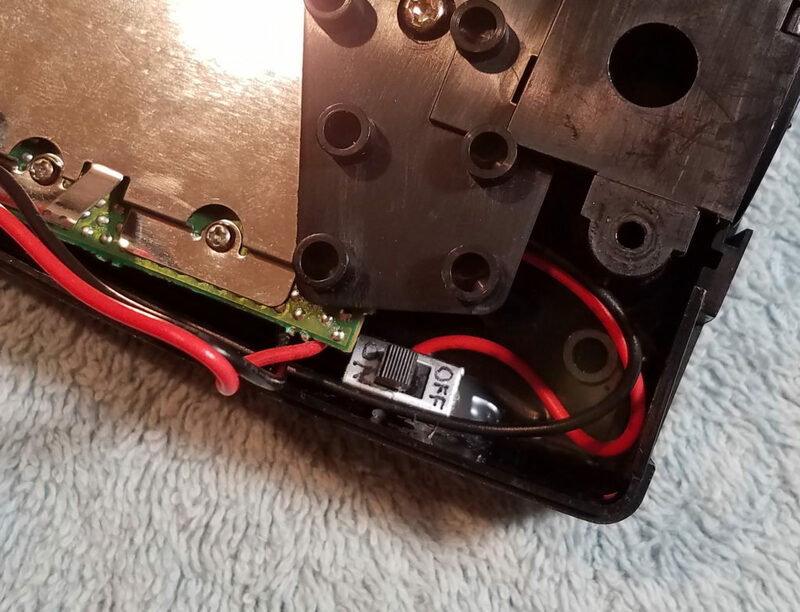 The Nomad’s original rechargeable battery pack used 6*NiMH cells to produce 7.2V (nominal 1.2V per cell), so the tried and true method for retrofitting new cells into these old packs has been repurposing a modern 7.4V LiPo camcorder battery (there are guides for this all over the internet). My solution was to use two 3.7V LiPo cells in series (cells arranged in series will sum their voltages, so two 3.7V cells add to a nominal 7.4V). 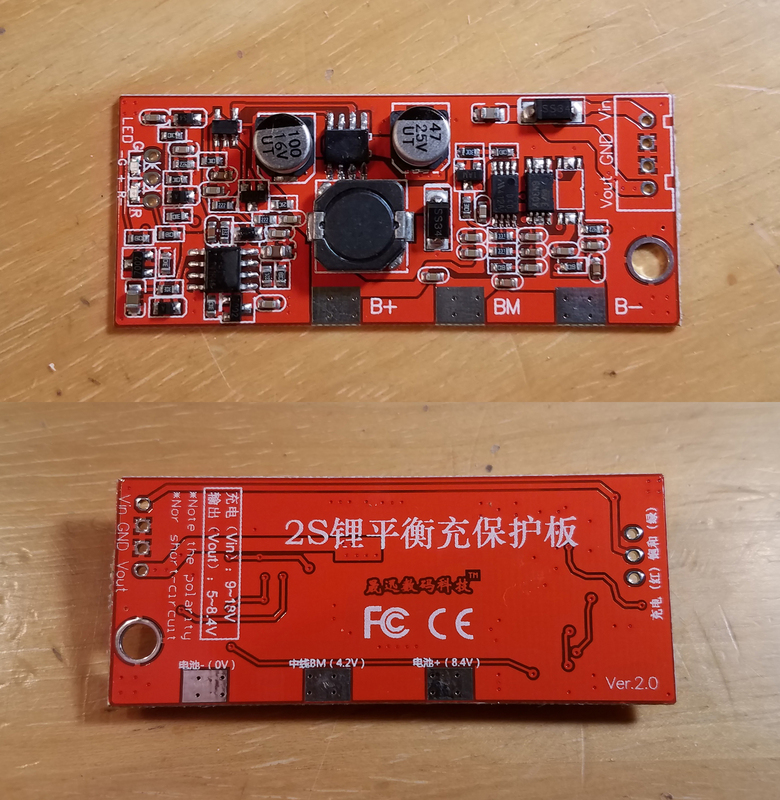 Lithium polymer (LiPo) cells are very common and inexpensive, and come in a wide variety of sizes and capacities, which gave me a lot of flexibility while shopping. A quick note on voltage: as a cell discharges, its voltage decreases in a predictable way, so voltage is the easiest way to measure a cell’s charge level. 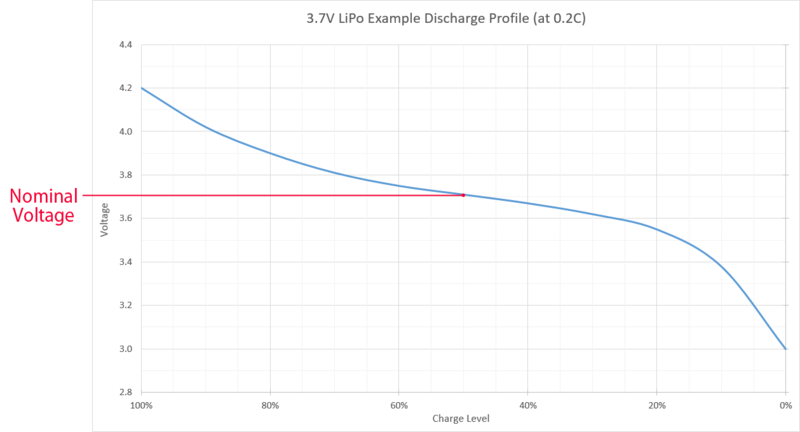 A “nominal” 3.7V LiPo cell will charge to a maximum of 4.2V (100% full), and discharge to a minimum of 3.0V (“empty”). This decrease is not linear, however. It decreases quickly at first, then gently slopes in the center, then quickly decreases again to its cut-off level (3.0V). The center of this slope is the cell’s nominal voltage rating. 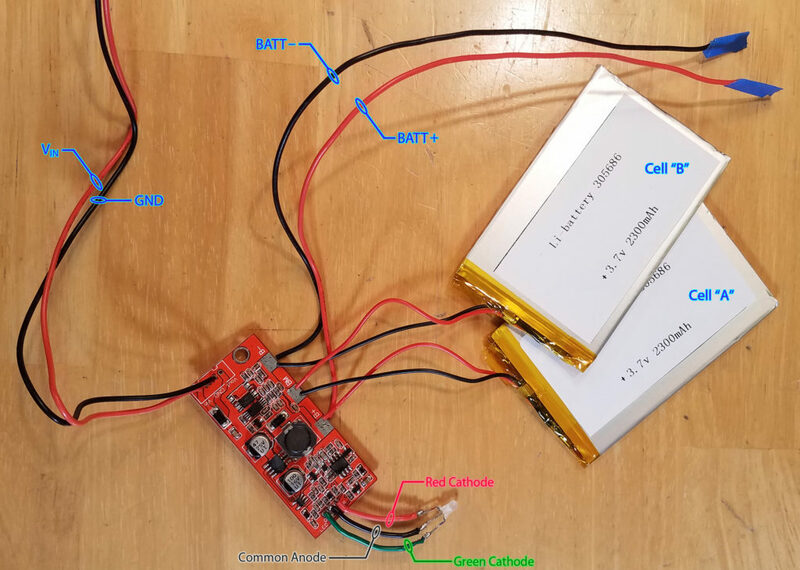 A LiPo battery needs two types of protection circuits: a single balance charging circuit for the entire battery, and an individual protection circuit per cell. The protection circuit protects each cell from overcharging/discharging, and the balance charging circuit (as the name implies) recharges the cells while keeping their charge levels balanced. 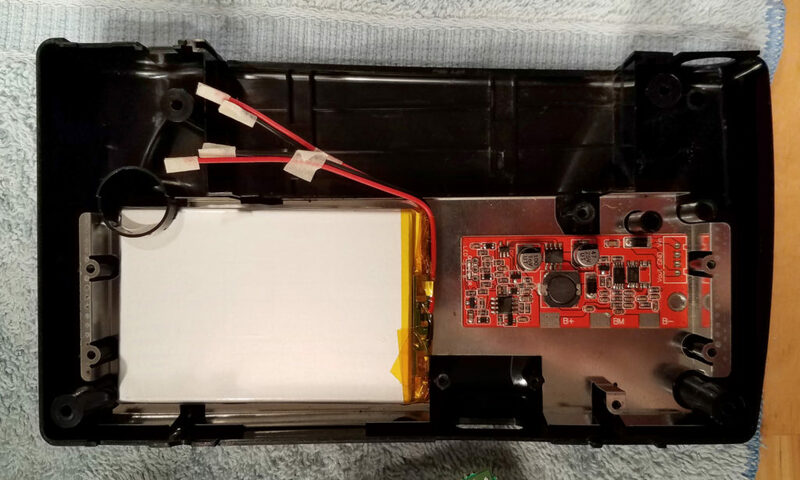 Most LiPo cells come with individual protection circuits built-in, so all I needed to provide was the balance charging circuit. There are other sites that can explain it far better than I, but at its simplest, the balance charging circuit works by varying the voltage and current to each cell in a cycle to recharge them evenly — you can’t charge a LiPo battery without one of these circuits or you’ll ruin it. A quick note on terminology: the words “battery” and “cell” are often used interchangeably, but the terms have distinctions. A cell is the individual component that stores and releases energy via an electrochemical reaction (i.e. this project uses two 3.7V cells). A battery (or battery pack), consists of two or more cells connected together as a unit (my battery is a 2S 7.4V LiPo battery). The voltage step-down circuit, or buck circuit, does exactly what the name implies, it reduces the incoming voltage to a desired value. My original intent was to use the OEM adapter (rated 10V/0.85A), and since the charging circuit would expect an input voltage equal to the max voltage of the battery (2 cells × 4.2V max = 8.4V), the OEM adapter’s 10V would need to be stepped down a little. This component ended up being unnecessary though — at the time, I failed to realize the OEM adapter is unregulated and is less than ideal for this project (more on this in the power supply section below). I didn’t want to do all this work if I couldn’t get a reasonable amount of playtime, so selecting cells was the most pertinent step. Using cardboard cutouts to mock-up the final sizes and layout, I settled on two 2300mAh cells. The cells have a large surface area that barely fits the length & width of the available space (though not without having to make some cuts to the internal plastic), but they were only 3mm thick, so I could stack them. I knew from previously testing my retrofitted 2900mAh external pack that a full charge provides about 4hrs 15min of playtime*, so scaling from that, these cells should provide around 3hrs 20min. Not great by today’s handheld standards, but good compared to the Nomad’s original 6*AA battery pack, which only gave around 2 hours at best (and even less for the NiMH rechargeable pack). These cells also have over-charge/discharge protection circuits built-in. * Note: This test was done using a copy of Sonic 3, left looping thru the title screen and demo sequence, with the volume set to ~50% (speaker, not headphones). My system is also retrofitted with a modern LCD screen which uses less power than the stock one, so your mileage may vary. It should also be noted that different games have different power consumptions, so results between games will vary as well. As for the buck and charging circuits, I found a combination unit that was perfectly rated and physically sized to fit in the remaining free space. It accepts inputs between 9-18V and will charge cells in a 2S battery configuration. The term 2S describes the arrangement of the cells, meaning there are 2 cells in Series (P would be used to label a parallel configuration). As stated above, I used two 3.7V cells in series to produce the desired 7.4V. The biggest reason I picked this board though, is because it was the only one I could find with built-in LEDs to indicate charging status (red for charging, green for full). The LEDs are surface mounted though, so they’re not visible outside the case the way the board is oriented. Fortunately, the board also has soldering pads to connect your own LEDs, so I found a pack of 3mm red/green bicolor (common anode) LEDs to use instead. “Common anode” is one of the two flavors of bicolor LEDs (the other being “common cathode”), where each color has its own cathode (an LED’s negative terminal) and both colors share the anode (the positive terminal). 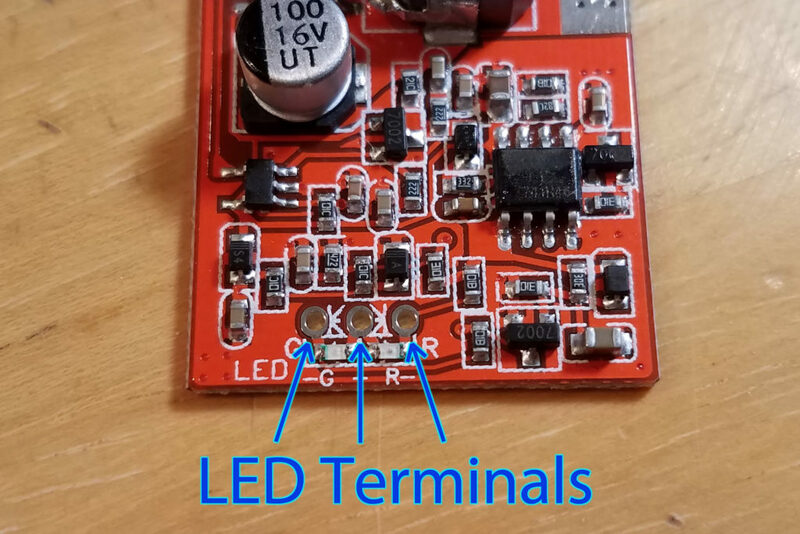 Figuring out which terminal needed to be common was an educated guess based on the boards markings — the circuit came from an international eBay seller who didn’t know anything more than his sell sheet. Fortunately, I guessed the type correctly. I almost went with red/blue LEDs, since I had previously replaced the front “low battery” light with a blue LED, but red/green just made more sense for indicating colors. 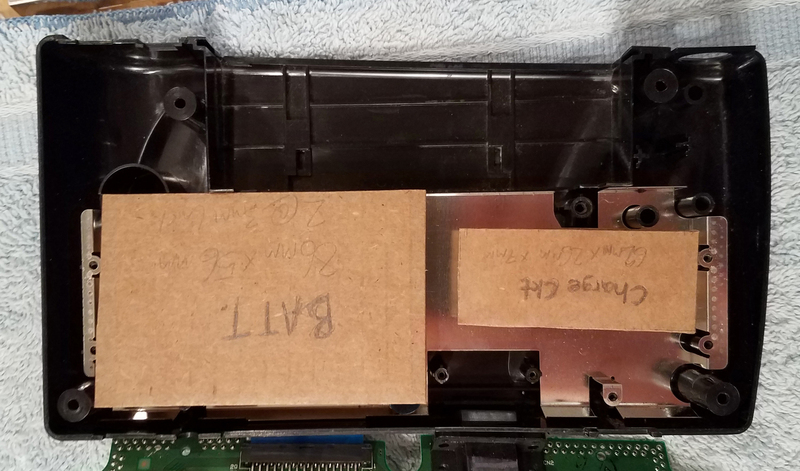 As mentioned above, I had originally intended to use the OEM supply (and it does technically work…kinda), but after a little research, I realized this wasn’t a good idea for a few reasons. First, it’s an unregulated supply. This means that even though it’s labeled 10V/0.85A, it doesn’t force a constant voltage. 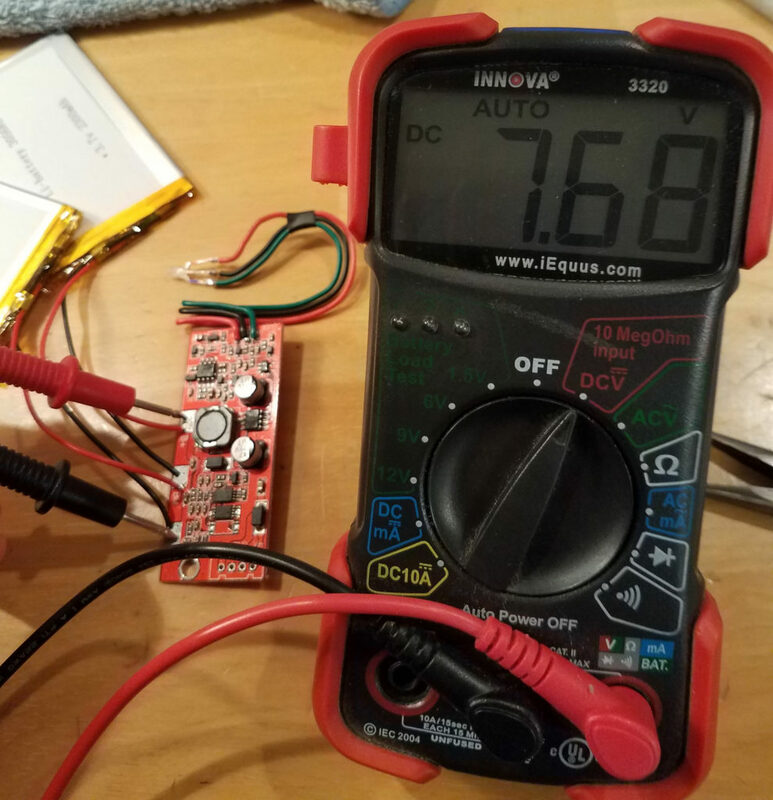 The actual output voltage will fluctuate depending on how much current is being drawn by the load at any given moment (measuring with my multimeter, mine reached almost 14V with no load). Since the charging circuit specifically works by varying how much current it draws, it’s clear why this would be a problem. Unregulated supplies also have poor noise filtration–meaning power fluctuations from the wall outlet will cause ripples in the power supply’s output. This combination will wreak havoc on the charging circuit & cells. First, the voltage rating needs to be suitable to charge the batteries, and to power the Nomad’s normal operation (i.e. playing games) via the DC jack. This latter point means the voltage must match the Nomad’s original DC input: 10V. Adapters rated 10V are very difficult to find, so the most common recommendation for 3rd party replacements is a 9V supply, which is close enough to not overstress the Nomad’s regulator. This is right at the lower limit of the charging circuit’s voltage input range however, so we’ll need to keep an eye on it. On a side note, a 9V supply is close enough to the charging circuit’s 8.4V requirement that the buck circuit is no longer necessary. However, the combination charger/buck circuit I used was the only charging circuit I could find with a built-in status indicator (the charging/full LED light). Second, the supply needs to be regulated. As discussed, a regulated power supply provides a constant voltage regardless of load, and gives better protection against electrical noise from the source (i.e. the wall outlet). Cleaner power for the Nomad means longer lifespans for the components within. Third, it needs a barrel that fits the Nomad’s DC jack, and it absolutely must have the correct polarity since using the wrong polarity will fry the whole system. The OEM supply’s polarity is center positive, meaning the contact inside of the barrel is the positive contact, and the barrel itself (the outside) is the negative. I measured the OEM barrel at 4.76mm outer diameter (OD), 1.72mm inner diameter (ID), and 9.9mm long. The ID of the barrel is a firm measurement, but the OD has a little flexibility if the exact size isn’t available–it can be a little smaller and still hit the DC jack’s contacts. Finally, the current rating. A little background: the power supply doesn’t actually “push” current through the attached device, the device “pulls” current out of the supply. The upside to this is a device will only pull the current it needs and will leave the extra, so normally when picking a power supply, you just need to make sure the supply’s current rating is higher than the devices max draw. This rule breaks down for charging batteries. As discussed above, battery chargers don’t have a strict minimum current rating like most devices do, they have an ideal rating that batteries will charge fastest at, but will still charge with a lower rating, just slower. The most readily available, not-overly-expensive adapters I found while searching had a 2A max output, which is good enough to provide an acceptable charge time. * Note: It turned out that I didn’t need to remove the A/B/C support post (the purple “X”)–the charging board would have fit just fine anyway…oh well. 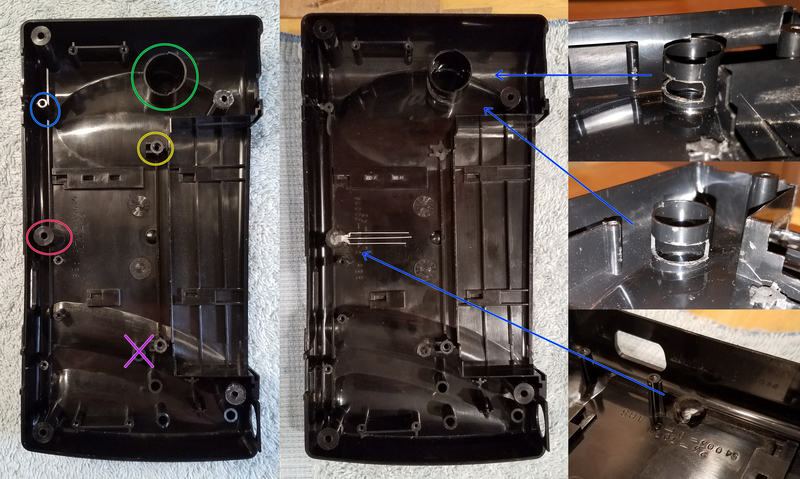 Before and after removing internal casing plastic. Fitting these batteries is a game of millimeters, every tiny bit counts. The posts below the D-pad (green) and the A/B/C buttons (purple) provide support to the device’s circuit boards to reduce physical stress from button presses. I’ve only removed one post from the A/B/C buttons, and the D-pad support is still sturdy even with the cut I made, so the remaining posts should still provide plenty of support (additionally, I’m no longer a less-than-gentle 10-year-old, so that helps too). One thing to note, with one of the screw posts for the cartridge door assembly removed (gold), the door assembly will be loose when it’s reinstalled. Once the system is closed up though, the door assembly will be pinned in place by the upper half of the shell, so overall its functionality won’t be impacted. The batteries were simple to wire. The positive wire of cell “A” and the negative wire of cell “B” connect to the charging board’s B+ and B- terminals, respectively, and the remaining negative and positive wires are tied together and share the BM terminal. The connection to the BM terminal is how the charging board keeps the cells balanced while charging. I had spools of wire in several assorted colors on-hand, so I wired the LED’s red and green cathodes (negative terminals) with wire colors matching their respective LED’s colors. Finally, I connected long lengths of wire, maybe 12” or so, to the charging board’s B+ & B- (battery output) and Vin & GND (power input) terminals to later wire to the Nomad (I taped over the other ends to prevent accidental contact for now). Next I needed to remove the Nomad’s original battery terminals, which pass directly thru the space where the new cells will sit. These terminals are V-shaped strips of metal that poke through the back side of the Nomad’s shell to connect to the external battery pack. These terminals connect to the Nomad’s circuit board by passing directly through it, and are soldered on the top side (points A thru D), except for one of the positive terminal’s legs, which is also soldered on the bottom side (point E). Points A and C are for the terminals’ stability only; there are no actual traces on the circuit board leading away from these points. Points B, D, and E are where the new battery wires will connect later on. I had two options; the simplest solution would be to just cut them off and trim the remaining stumps as short as possible, or, I could try to desolder and save them. Desoldering would be riskier (traces on the board could tear, the heat could damage a nearby component, etc), but it would give me the option to “undo” most of this mod should things not work out (I could remove the cells and charging board, reattach the pins, and the system could use an external pack again). I decided to take a chance and desolder them. The negative terminal was simple to remove, and having it out of the way helped with removing the positive terminal. To remove it, I gently pinched the terminal’s legs together with pliers while I desoldered one leg at a time, and they easily popped right out of their slots. For the positive terminal, I used the same method to detach the “point A” leg, but the remaining point B/E leg was tricky. 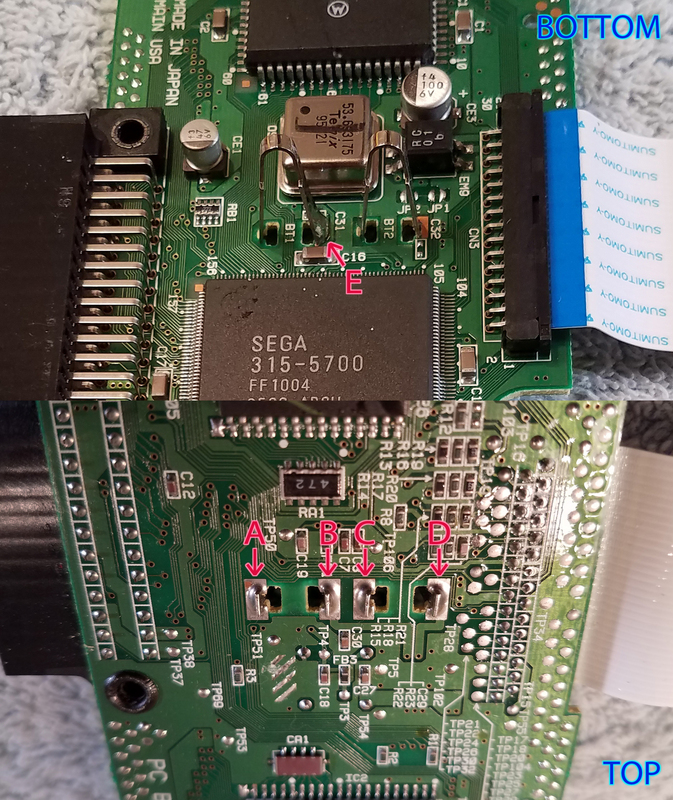 In order to not tear the tracing on either side, I individually heated each point and used my desolder pump (a syringe-like device that vacuums up molten solder) to remove as much of the existing solder as possible. With point A detached, I went back and forth heating each point and rocking the leg slightly back and forth each time, bit by bit pulling it away from its slot until it finally popped free. As much as I’d like to claim skill for this success, frankly…I think I got lucky. Cutting them would probably have been the safer way to go. I’ll need to re-bridge points B & E later on. Next, I mounted the battery assembly inside the shell. I layered electrical tape on top to hold the charging board in place, and to insulate it against accidental contact with the Nomad’s board above. The cells I handled a little differently. I made a “sheet” of electrical tape by sticking short lengths of tape together longways, then I folded it in half so neither side was adhesive, and finally I laid it on top of the cells. Why didn’t I just tape the cells down like the charging board? Well…I don’t really know. At the time, I didn’t want to put tape on the cells themselves for some reason, but in retrospect I’m not really sure why. The cells didn’t really need the extra insulation (but I figured better safe than sorry), but the tape wouldn’t have harmed the cells, so I don’t know what I was thinking. The “sheet” of tape seems to work well enough though, and the cells are held in place by their surroundings without needing extra tape, so unless it becomes a problem, I suppose I’ll let sleeping dogs lie. The wires from the cells to the charging board need to lay on top of the charging board because of the Player-2 controller port, which will sit in the space right below this board. Devices that can draw power from a secondary source, i.e. a battery pack, use a DC jack with three terminals: positive, negative, and switching. The switching terminal is how the system senses when the power cable is connected, so it can switch from the battery to wall power. On the reverse of the board, the DC jack’s terminals are labelled as follows: terminal TP201 is the positive, TP202 is the negative, and TP203 is the switching terminal, so the Vin and GND wires are wired to terminals TP201 and TP202, respectively (the switching terminal, TP203, is not needed for this mod). The lengths of these wires (and those for the battery connection in the next step) were estimated based on how I planned to route them. Take a look at the wire routing image further down for reference. Next, I connected the B+ & B- wires from the charging board to the Nomad’s original battery terminals (on the rear circuit board). As mentioned above, The connection between points B & E (the positive terminal) was severed when I removed the original “V” terminal, so they need to be bridged. 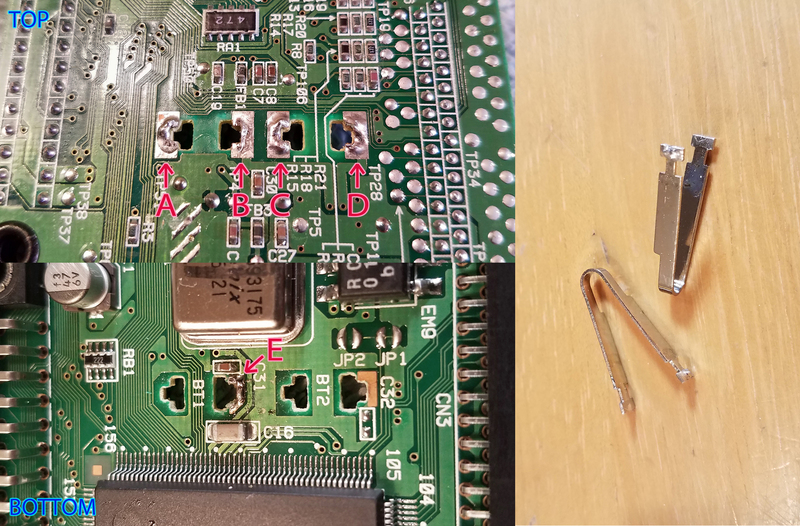 I stripped a little extra off the end of the B+ wire and made a hook shape, then soldered it to both sides of the board (see the diagram below). Finally I covered the battery solder points with a piece of electrical tape for insulation. As an afterthought, I added a small “kill switch” inline on the B+ wire so I could disconnect the batteries from the Nomad, should (or rather, when) I need to work on the system again. The switch is hot glued to the inside of the shell, in the upper corner near the AV-out port. It’s a tight fit, but it just clears the surrounding components. This picture is a little misleading, it’s not that close to touching the circuit board. 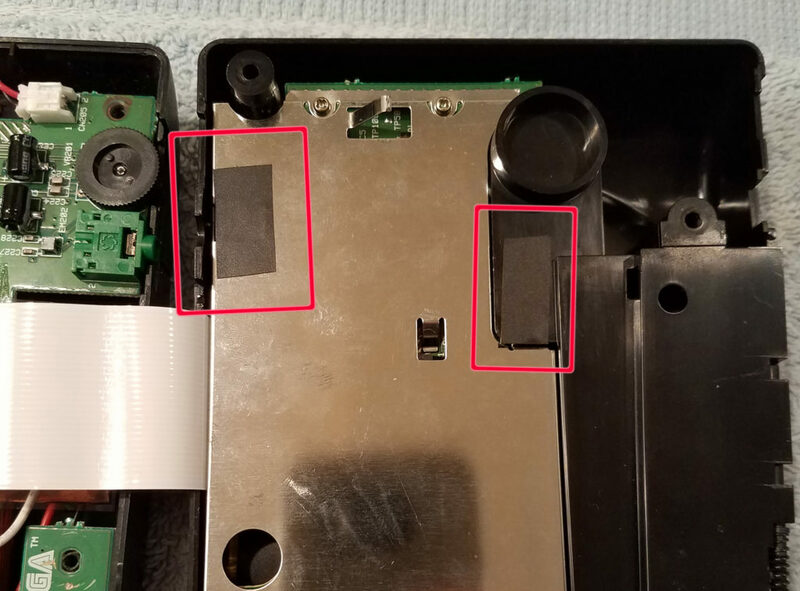 To prevent myself from accidentally driving screws into the battery (due to the removed screw posts), I covered the now unusable screw holes with tape. Finally, time to close up the system. The B+ & B- wires (the dashed red line) travel between the bottom circuit board and the remaining “center” RF shield, and weave through the upper corner around the button support posts, where they connect to the charging board and kill switch under the Nomad’s bottom board. 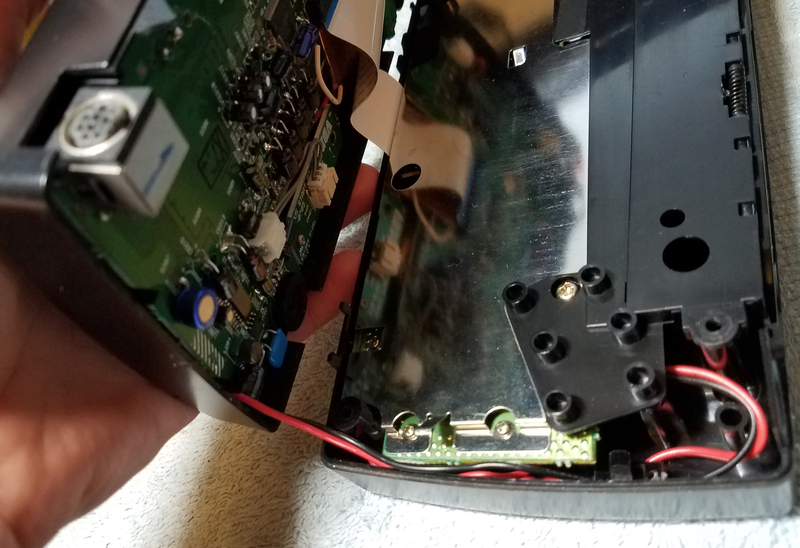 The Vin & GND wires (the dashed blue line) travel from the DC jack’s legs under the Nomad’s top circuit board (pinned to the shell by a few small strips of tape), around the LCD, and out from the bottom corner near the contrast dial. From here, they travel back up to the top of the back half, where they wrap under the Nomad’s back board to connect to the charging circuit board’s input. I left just enough slack in the DC power wires (the blue line) for the two halves of the Nomad to be opened along the bottom seam and lay flat. This extra wire just tucks into the side when the shell closes. Before closing the shell, make sure to flip the battery kill switch to enable the batteries, like I sure didn’t do! Aaand, it seems to be working! 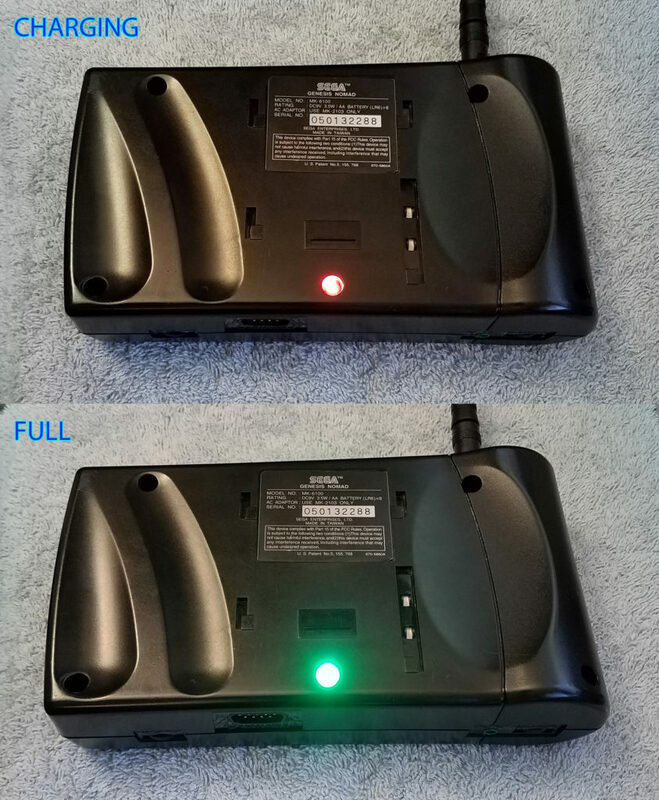 After a preliminary check, the Nomad runs both on the internal battery and from the power cord, and can switch seamlessly between the two without interrupting gameplay. The charging LED on the back also lights up as expected: red to indicate charging and green when full, though I will note it’s incredibly bright… I might have to add a resistor to dim it. No smoke or flames so far, but the most important part is yet to come: temperature testing! 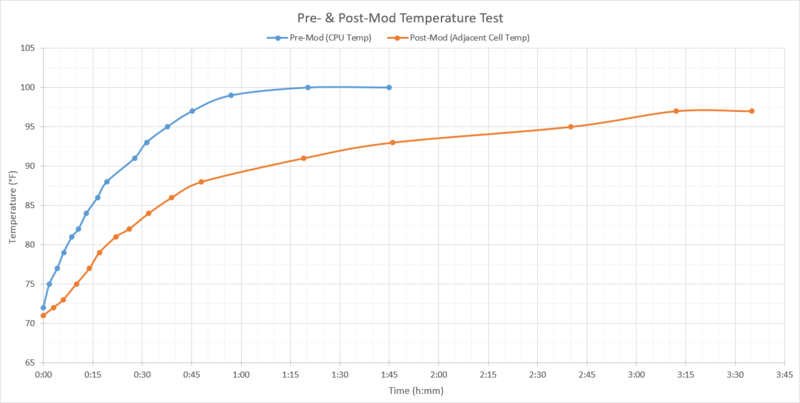 From my earlier test, I knew the adjacent processor would take a little over an hour to peak at 100°F (37.8°C), but I needed to test its effect on the new cells. Since there’s still a small gap between the processor and the upper cell, I hoped the heat transfer wouldn’t be too rapid (or ultimately too high). I attached the probe wire to the top cell, about center to where the processor would be, and routed it out through a gap in the contrast dial’s slot. After fully charging the cells and letting them cool to room temperature, I put in my copy of Sonic 3 (which I used for the initial test), and left the system running the title screen/demo loop. I used a webcam to film a time-lapse of the thermometer and a nearby clock and let the system run until it died, then graphed the temperature changes. I stayed in the room while it ran and checked it occasionally to make sure I wasn’t about to accidentally burn down my house. While the cells did absorb a good amount of heat from the CPU, they didn’t quite manage to hit the 100°F (37.8°C) peak set by the CPU, even after 3½ hours of operation. While the temperatures the cells did reach are warmer than ideal operating conditions, it’s well below the spec sheets 140°F (60.0°C) maximum. All things considered, this has worked out better than I hoped for. The battery temperature doesn’t rise too quickly, and stays well below the 140°F (60.0°C) maximum operating temperature. Given these results, I would call this a successful modification. But what’s just as important as whether or not the mod worked is, can it be called safe? Well… it’s safe-ish. It’d be hard to say that operating the batteries at close to 100°F (37.8°C) is a good idea, because really it’s not; but, are they likely to leak, rupture, or catch fire? From my research, and in my non-expert opinion, no; realistically they’ll be fine for regular use. The higher temperature will probably impact the battery’s life expectancy at least a little, and it’s also probably slightly reducing the total play-time you would otherwise get per full charge if it was external, but I’m happy with the results either way. It’s also worth noting that the charging board I’ve used only seems to charge the battery to ~8.25V before indicating a full charge (via the green light) and cutting off power. This is only 95% full capacity (it should charge to 8.4V). It’s a small deficiency, but hey, that’s still about 10 minutes of playtime I’m being short-changed. Also, on the subject of recharging, the cells’ spec sheet lists the maximum charging temperature as 113°F (45.0°C). Since the cells never actually broke 100°F (37.8°C), it shouldn’t be a problem to start recharging immediately after they died. In practice though, it probably wouldn’t be a bad idea to wait maybe a half hour, just to let them cool down a bit for the sake of longevity. I have a few ideas for this project I might revisit somewhere down the line. The rear LED I added to indicate charging status is incredibly bright; I might try adding a resistor to dim it a little. I’d also like to add some sort of lens in the hole to “pretty it up” so it’s not just, well, a hole with an LED sticking out. I’m also considering experimenting with an internal fan to help cool the battery/processor. I’ve seen fans on eBay as small as 15mm X 15mm, intended for cooling arduino CPUs. There’s still more unused internal space available, I bet I could figure out a way to fit a fan or two in there. The real question is their effectiveness. A fan’s ability to move air is measured in CFMs (Cubic Feet per Minute), but I don’t have much of a concept for how strong a CFM is, or how much might be needed for a fan to have any effect. There really is a surprising amount of wasted space inside this system compared to other handhelds… makes you wonder why Sega didn’t try to slim it down a little more. Maybe there were time or budget constraints–the Nomad was released at the end of the Genesis’ life cycle after all. Just curious, why did you tap off the batteries directly for the nomad power instead of using the VOUT on the charger? Honestly I can’t remember for sure, been a little too long, I think “Vout” was just a passthrough for “Vin”, not the battery, so it’s only live when the power cord is plugged in to charge the battery. From testing, Vout passes through both the cord or the battery depending on if charging or not. i’ll try it in my nomad and see. Tried it in my nomad using the Vout, nomad wouldn’t charge or power up… strange quirk of the charger. wired it like you did, direct to the cells, and everything works wonderfully. Thanks for the great guide, i’ve installed 2 of the 3000mah cells inside. But, I figured out that of you want to use Vout, D201 under the DC power jack needs to be removed, as well as jumping TP202 and TP203. The charger will then handle the voltage switching from cord/battery. If the diode isn’t removed, then it tries to backfeed the charger’s Vout and the system won’t power up. the rest of the wiring is the same, EXEPT connecting to Vout instead of directly to the batteries. here’s h0w the switching works: Plug cord in, charger Vout is the same as Vin, and the charger starts charging batteries. unplug, and Vout auto switches to the battery. you can seamlessly switch between charger and battery without worry about resetting the system. The low battery light even works. It seems like a good bit of extra work just to use the charging board’s Vout pin when you can just tap the battery directly, but whatever works for you. If you took any pictures I’d love to see them. I’ll, send pics when i open the unit. nicely done. just finished mine up. got a link to the charger pcb for future use? Those specific LiPo batteries aren’t available now. Do you have the specific dimensions available (other than the 3mm thickness)? This is amazing! Thank you for posting this!! I remember they offered a rechargeable battery pack “hump” but it was crazy expensive for the time (close to $70), not that effective increasing play time, and the quality of those batteries/cells wore out too quickly. Thanks! Glad people are digging it! The Nomad’s always been my sentimental favorite, and I’m thrilled this has worked as well as it has. I hadn’t planned to make a video originally, but a couple people have asked, so I’m considering it (though honestly there’s not much more I can show than is already in the above pictures). 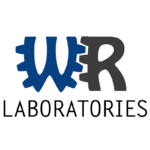 WR Labs Copyright © 2019.